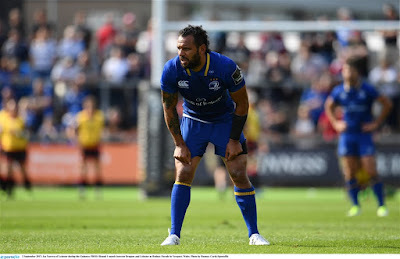 That was a quote in the New Zealand press from 2008 as the news was breaking that Isa Nacewa, then of the Auckland Blues, was making the move north to join Leinster. It was the appraisal of his then coach, a chap you may have heard of called David Nucifora. Nowadays, of course, he needs no introduction to Leinster fans. He's so important to the culture of rugby in the province we sing his name a minimum of three times at any one go. Yet on Saturday, around nine years after his arrival, he somehow managed to add a further dimension to his skill set. For not only did he put in a display at inside centre in Newport that demonstrates that he is able to “fill in” while the likes of Robbie Henshaw and Noel Reid are unavailable, he actually has you wondering just how easy it would be for anyone to get that 12 jersey back off of him. Trust me, I really don't like overstating things, and I'll get to the quality of opposition later, but having also seen him with my own eyes play there against Gloucester, I must stand by what I'm saying. Had he simply done the basics and made no mistakes we would still be offering praise, but this was all that and then some. Isa was everything Leinster needed at each moment he was involved. Crash ball? Grubber past rushing D into their 22? Neat offload? Force a turnover? Clear out? Key scrambling tackle? Those are only some of the boxes he ticked on the day. And what's more, playing there brings the Leinster club captain a lot closer to the referee. The more you watch highlights of this match, the more you think this could well be where he belongs right now for us, with all due respect to others vying for the shirt. But let's not forget his centre partner on the day Rory O'Loughlin. He did some great things for Leinster on the wing last season but I always got the sense he had 13 in his future and on Saturday he teamed up extremely well with his skipper, cutting through gainlines with neat offloads one minute, locking down their own defensive channel the next [12 tackles each led the team along with Scott Fardy]. Not a pairing most Leinster fans would have pencilled in at centre, but one we'll be happy to see in matches to come. As Bernard Jackman said that I figured the humility had to stem from one of two things - either he was masking a quiet confidence or he actually had concerns over his squad's ability to keep up with his former province. I knew for sure it was the latter long, long before the final whistle blew. Still, the Dragons definitely looked like a side that had things to build on. Their lock pairing of Matthew Screech and Cory Hill were very strong up the middle, they had good pace on the wing with Amos and Hewitt, and some talent on the bench as well like Max Williams. And their strategy appeared sound - Berch would have been well aware of Leinster's lightning quick line [Laighean?] speed and had his charges ready to counter with a kicking game to keep us turning as much as possible. But it was putting boot to ball that was to be their biggest failing of all, and when that wasn't offering the platform they needed, it was almost impossible to compensate. Biggest among the culprits in the kicking department was Gavin Henson. Putting three central penalties over the bar was no bother to him, but from the hand he was positively awful. 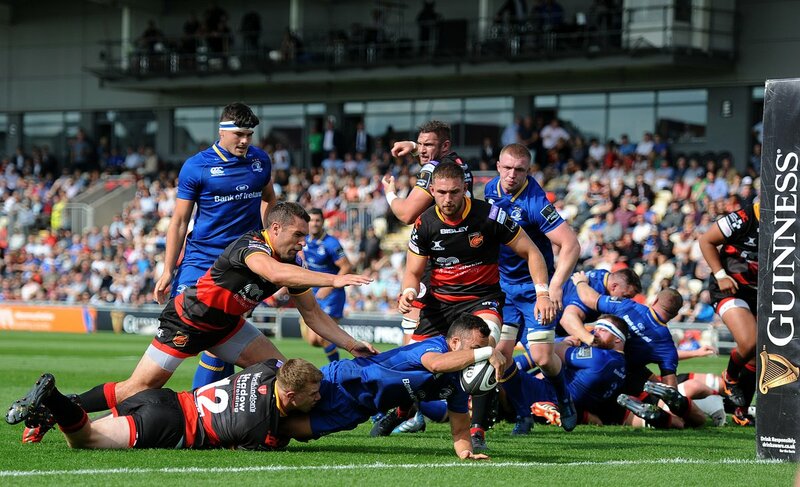 I know you can't always rely on the bounce of a rugby ball but there are techniques you can use to skew things in your favour yet he seemed to think he was playing on the old Rodney Parade mud, not the 4G surface the Dragons got as part of their WRU-backed facelift. To be fair his team-mates, including Zane Kirchner, weren't faring much better with the boot but it got no better for Henson in the second half when he pretty much walked into a choke tackle with no idea it was coming and the final insult was a ball thrown straight to Barry Daly [albeit as they were chasing consolation scores] that led to our final try. Speaking of tries, let's start harping on Leinster's ones shall we. It took us a while to get into our stride, with an early attacking lineout going astray making me wonder if we had learned nothing since last season. But as it turned out they were but cobwebs that needed brushing away and with the score 3-3 early in the second quarter Isa crashed through the gainline before kicking his legs and getting us almost to the line. His offload went straight to Screech but such was the support that the Dragons lock was shoved over the line giving us a five metre scrum, providing the perfect kind of platform for Jamison Gibson-Park. I was critical of the Kiwi last season, not because he lacks ability, rather his game isn't quite yet calibrated to the Irish mindset. And those drawbacks were to be seen in this display as well - the box kicks were still too long and more than once he struggled to take the ball from the base of rucks, a sign of hesitation. Perhaps a week in a Joe Schmidt training camp is what he needs though for that he was probably have to wait at least another year. But for Leinster's opening five-pointer of the new campaign we saw the scrum-half at his sniping best, selling his opposite number down the river with a dummy before stretching over the line. That seven points was the difference at halftime but right from the restart we looked like a team on a mission for all five match points. Sean Cronin brought everything we need from him with a crashing run into the 22 plus an accurate dart in an attacking lineout from which our maul was hauled down by Screech persuading ref Mike Adamson to award not only a penalty try but also a yellow card. We made the most of the extra man moments afterwards when a poor Dragons clearance put us right back on the attack and having gotten to the line, once again it was Isa involved with quick hands shipping it to promising rookie Jordan Larmour for the score. Then came the call to the bench with a young front trio of Porter, Tracy and Ed Byrne taking over for Leinster among others. As often is the case it took us a while to settle down with the changes but the Dragons still weren't threatening and eventually our bonus point came, well worth the wait. Yes, you guessed it, Isa played a part here too, this time burrowing into a ruck and pinching the ball before two other replacements, Jack Conan and James Ryan combined to march us up the field. Once in the 22 we kept the phase counter rolling to 14 before a deft offload from Conan put Dan Leavy over. 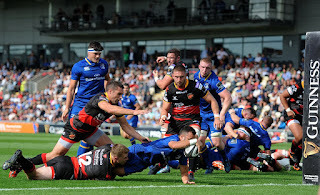 The Dragons' bench did reasonably well themselves, albeit with the match long since decided, and they rewarded their fans with a penalty try of their own when Hewitt was high tackled by Adam Byrne as he was about to go over, with the Leinster winger also seeing yellow for his trouble. But even with a man down we kept the pressure on. Honourable mention must go to Scott Fardy who, despite being in an unfamiliar position himself, was every bit the poacher around the breakdown we expected him to be. And with Leavy, van der Flier and Healy in on the act as well throughout, the home side really never could settle with the ball. Finally it was Henson handing us back possession towards the end which eventually led to Cathal Marsh forcing his way onto the scoresheet. It had been a solid outing from Ross Byrne throughout but you could tell Marsh and indeed all the Leinster subs were keen to make their mark. Yes, this was in the end a very easy bonus point victory, but we all know Leinster have made very heavy weather of past matches just like this one and at this time of year. Once we hit our stride we showed all the signs of a squad well coached in the preseason and ready to hit the ground running.